A tiny boat on a stormy sea: this is the scenario at the beginning of this video, with the refugee boat off the coast of the fifth continent being told to stay away. Canberra. Little Ferouz has not had a good start to life. Born as the son of an asylum seeker from Myanmar, Australia has refused him a protection visa. Despite having been brought into the world in a hospital in Brisbane 11 months ago. But because his mother fled to Australia by boat, she is considered an “illegal boat arrival”. And that also applies to her son, a Judge confirmed on Wednesday. Ferouz is faced with deportation to an internment camp on the Pacific Island of Nauru, surrounded by barbed wire. 100 other children are faced with the same fate. No asylum seeker who arrives in Australia “illegally” will be allowed to stay, Prime Minister Tony Abbott has declared. In Pakistan the government warns with huge posters and billboards that they will find no luck by fleeing to Australia. An image of a fishing boat floating in the sea with warning: “The message is simple. 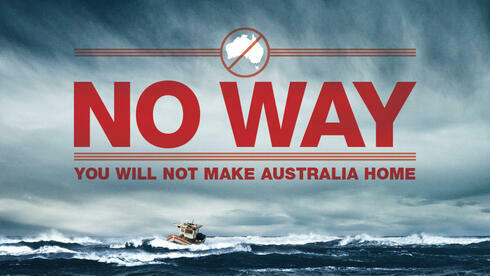 If you come to Australia illegally by boat there is no way that Australia will ever be your home. There are no exceptions”. The case of Ferouz and the billboards have, in the last few days, made worldwide headlines. This is rare. Normally Australia is represented in European media as a holiday paradise with kangaroos, beaches and friendly people. The country has another side – a state bastion of institutionalised, state sponsored and publicly supported inhumanity. J’accuse – I accuse. The title of the protest letter that over 190 human rights lawyers, ethicist, doctors and organisation sent to the Australian government says it all. The conservative government is pursuing a brutal, inhumane policy of deterrence against Asylum seekers “from children to adults, despite clear evidence that this treatment results in psychological illnesses, self-mutilation and suicide”. Psychiatrist Peter Young is very direct: the practice of “mandatory detention of boat people is equivalent to torture”. Young was responsible for mental health services in the camps, until he could no longer do the work because he was unable to protect people from harm, under his obligations as a medical practitioner. “If we define torture as a deliberate injury to people, forcing them to a particular result, then Australia’s system corresponds with this definition”. “Boat people” are asylum seekers who come to Australia by sea. Almost all of them are people from the Middle East, Sri Lanka and even Myanmar. Most of them have received help from people smugglers to board a barely seaworthy fishing boat. The government diverts them to Christmas Island and leaves them under the laws of Christmas Island, even though it is an Australian territory it is thousands of kilometres from the mainland. If they are picked up by the Australian navy they are sent to a maximum security prison. The waiting begins. Months – sometimes years – without any knowledge when a decision about asylum seekers will be made. This chronic uncertainty is largely the reason why a large portion of the detainees suffer from mental health issues and are even suicide hazards. Young says “the system is designed to create a negative mental state”. The crossing (journey) is a lottery: In 2010 48 Asylum seekers died at sea including children, as their boat capsized off the coast of the island in stormy seas. Critics fear that the true number of the victims is somewhat higher. Any requests to Immigration minister Scott Morrison are usually rejected. The politicians are relying on the rule that whatever happens at sea is secret because “I do not want to give the people smugglers any protection”. Even in the camps there is an “obsession with secrecy”, say critics like Young. When the Human Rights Commission wanted to publish evidence of the endemic psychological damage suffered by the detainees, the government asked them to “withdraw the numbers”. “Abbott and Morrison’s policy of cruelty to the most vulnerable of the World is not new – it is just more brutal” says one “refugee helper”, who, like so many insiders, wishes to remain anonymous for fear of consequences. Since the nineties, under the Labor government, the forced removals of boat people has been occurring. Previously they were hidden in camps in the Australian desert, now they are hidden in Christmas Island and the isolated island of Manus in Papua New Guinea, and also in Nauru. There the people live – among them hundreds of children – under conditions that are described by independent experts as inhumane and cruel: inadequate, overcrowded accommodation, poor nutrition, water supply and infrastructure and no protection for women. The worst affected are the children, says Gillian Triggs. According to the President of the Australian Human Rights Commission, there have been 128 cases of self-harm and suicide committed by children between January 2013 and March this year. 38 children have already been detained for over a year, she said after a visit. “They begged us to give them our pen” said the lawyer, visibly shaken. The children had no employment opportunities, were apathetic, and obviously psychologically damaged. There is a system of “depersonalisation” that rules the camps, say former guards. Detainees are not addressed by name, but rather by their file number. Morrison states regularly that such accusations are unjust and politically motivated. Canberra pays both Nauru and PNG hundreds of millions of dollars per year to receive these asylum seekers. The UN, humanitarian organizations and many experts lament about how extreme the Australian asylum policy is, and how it is contrary to international agreements and practice. "Save the Children" writes in a report of a "systematic violation" of human rights asylum-seeking children in the camp on Nauru. The paper reports on physical, verbal and sexual abuse of children, delayed or frustrated medical care. Members of families will be divided, and severely mentally damaged inmates do not receive sufficient psychiatric supervision. Psychiatrist Louise Newman complains that a camp commandant confiscated prescription drugs from new arrivals to the camps. As a result, a three year old girl had suffered epileptic seizures. A boy had been forced to read lips, after his hearing aid had been removed from him. The first word of captive born babies was not "Mama" or "Papa" but "keeper". Journalists attempting to verify such reports are denied access to camps. Critics of the conditions in the camps have to face the consequences. Immigration Minister Scott Morrison accused "Save the Children" of encouraging inmates to commit unauthorized actions against the supervisors. The members of this organization which is respected around the world have been removed from the camps, while an investigation of the allegations against them is conducted in the interim. Actually, in comparison with Europe, Australia has no Asylum problem, says Janet McAdam, Professor at the University of New South Wales. 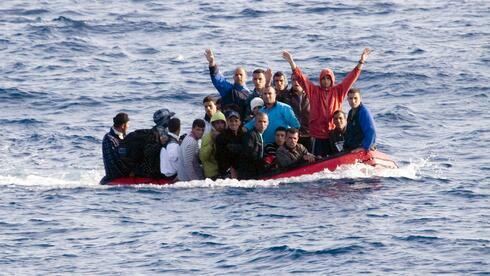 In the five years up to 2012, approximately 2831 people have arrived into Australian waters by boat. 2012 saw a short term peak of 17,202 boat people, but even this is only fraction of the world’s asylum seekers, says McAdam. In 2013 there were around 51 million refugees globally. Australia takes from the United Nations only 13,750 refugees per year. At the same time, the country accepted approximately 190,000 immigrants who were mostly from professional or wealthy backgrounds. Australians knew very well before the last election what the future of Asylum seeker policy would be. And they wanted, as the slogan read, to “stop the boats” - not least thanks to the incessantly repeated campaign promise Tony Abbott recited in September 2013 in his campaign against his Labor opponent, the then Prime Minister Kevin Rudd. Abbott has not disappointed his followers. For months there have been no more boats arriving in Australia. However, critics say it is not because they (asylum seekers) have given up. Rather the Australian navy intercepts the boats and tows them to Indonesia – in total 12 since December last year and May this year, as Morrison confirmed in a surprising albeit brief departure from his usual policy of secrecy. This practice, condemned by Jakarta, has severely damaged the relationship with their northern neighbour. Abbott is even clearer. It was “unchristian” to not go the “ordinary” way through the UN refugee program. For some of his critics, this statement is proof that the government sees its fight against refugees as a "crusade" against non-Christian, Muslim arrivals. The failed would-be priest, Abbott, and the majority of his cabinet members do not conceal their strictly Catholic ideology. Morrison belongs to an ultra-conservative Pentecostal Church-United Church. “There is no queue!”, expert Jane McAdam makes clear. Many countries and refugee camps lacked a UN agency where asylum seekers could report to. In addition, there were far too few places for refugees worldwide. For all currently displaced refugees to have found a new home, it would take 117 years, according to McAdam. However, such rational arguments count for little in the public debate. Despite criticism from the UN and human rights activists: Abbott and Morrison know that they have the people behind them. In a survey, the majority of Australians expressed support for the policy of deterrence. 60 percent of respondents even demanded that "the tough treatment of asylum seekers should be strengthened". And this is even though 90 percent of all applicants are finally recognized as "genuine" refugees - i.e. that have a legitimate claim to asylum. The opposition to asylum seekers is even more remarkable considering that modern Australia is one of the most successful multicultural societies in the world: one in every three Australians was either born outside of Australia or born to migrant parents. The prosperity of the country is not least due to the hard work of refugees. Whether Holocaust-surviving Jews or boat refugees from Vietnam: since the second World War the country has accepted tens of thousands of asylum seekers who, since arriving on the continent, have through hard work not only forged a life for themselves and their families, but have also made important contributions to the Australian workforce. The young Australian economic history is full of “Dishwasher stories” – examples of displaced people who came to the continent with nothing in their bags but prospered anyway through hard work and determination. Five of the eight Australian billionaires are refugees themselves, or stem from refugee backgrounds. Frank Lowy for example was a Jewish refugee who fled from Hungary and came to Australia with just a few cents in his hand. He built a Shopping Centre empire that spans Australia, the USA, and Great Britain that tens of thousands of people visit. In August, as asylum seekers attempted to commit suicide in the hopes that they could “at least save our children” Prime Minister Tony Abbott reacted with the words: “I do not think Australians would want us to surrender to moral blackmail”. The fact the politicians can successfully foster an “Australians against the others” climate explains the phenomenon of virulent rejection of the asylum seekers, but only partially. Immigration expert Stephen Castle says that there a “deep rooted fear of an invasion from the north – from Asia – over the sea” that contributes to this resistance. The forced detention, rather grotesquely, does not apply to those who come to Australia by aeroplane – also several thousand per year. The debate would hardly be so toxic if the majority of the media wasn’t so generally negative towards asylum seekers, all the while being uncritical of the government. In relation to the regularly recited statement by Morrison that “boat people” come to Australia “illegally”, there is hardly any opposition in the media to this statement. Although the statement is false, it is regularly repeated by journalists, states expert Janet McAdam. According to Article 14 of the UN Universal Declaration on Human Rights, all people have a right to seek asylum in another country. And Article 31 of the Refugees Convention states that, what would in any other case be considered “illegal” – i.e. entry into a country without a visa – does not apply to asylum seekers. In the majority of newspapers and radio asylum seekers are often portrayed as lazy and dangerous. In fact, the opposite is true: Asylum seekers are on average 45 times less likely to commit a crime than the average Australian. Most of them create an economic existence for themselves soon after arrival. It is usually that they are qualified professionals or middle class people who had to leave their homes because of acute danger and persecution who are willing to get back on their feet and contribute in a meaningful way. Since Abbott's takeover a year ago the public debate has been more frequent and direct in the press, and perhaps the most important reasons for rejection: xenophobia and racism. The fact that most asylum seekers are of Islamic faith is used by conservative politicians and PR people repeatedly to draw an imaginary connection to Islamic terrorism. As a political commentator recently said: "If they did not act like Muslims around other people, but instead like white people - like us - watching rugby, drinking beer and eating meat pies, there would not be this debate anyway."